A little over twenty years ago I boarded a small plane in the UN base in Lokichogio, northern Kenya, to fly into a remote area of South Sudan. We were heading for a place called Mapel, a base from which Save the Children’s team supported what local people were doing to keep life going during the long drawn out civil war. Mapel is about as near the middle of Africa as you can get – put a pin in the centre of the widest part on the map, and you’re almost there. Far from cities or any sign of economic development, it had become a gathering point for people who had fled marauding armies. We flew over an apparently empty savannah landscape, over dry river beds and occasional collections of mud and thatch huts. It was difficult to get a sense of what people down there must be dealing with, or what I might encounter when we landed. A small airstrip came in sight. We landed, and I stepped out. It took a moment to adjust. So many physical sensations … the feeling of feet on the earth again … the glare of sun from a punishing, cloudless sky … the limitless sense of space, with low trees fringing the edge of the airstrip … And – Music! Loud, energetic, and right here, the voices of a large group of people clapping, moving their bodies – singing to welcome us. For a few minutes more I stood, amazed, till the rhythms took over and I dumped my small case and moved to join in. The nearest women caught my hands and drew me in, laughing as they sang. The call-and-response lines pulled my voice along with theirs – it didn’t matter that I had no words – and my hands clapped and my feet moved with the beat, because that’s what music does to a human body. All anxiety I might have felt about coming here was gone. I was an outsider, privileged, unaffected by the war that had devastated their community, moving through the world while they were trapped in one small corner of it – but for that moment the music made us one. That is music’s unique, universal power. But this is also a specifically African use of music. I have been greeted by singing, clapping groups of women in Zimbabwe, where Save the Children supported farm workers to negotiate with farm owners to build preschools for their children; in Mali, where they sang to educate their communities about how to protect against the spread of HIV, using traditional work songs to face new challenges. 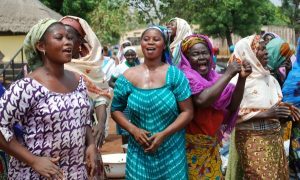 Across the African continent people with different histories and social systems sing in totally unrelated languages, moving their bodies to rhythm in the same way, to use music as part of everyday life. I grew up in Africa, my bare feet on the same soil. 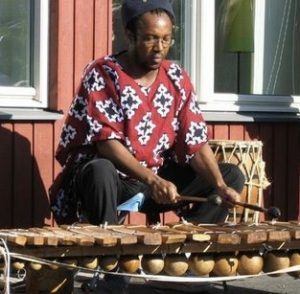 As a child in the white community the music I heard around me came mostly from different sources, yet one of my earliest memories is of being enchanted by the deep, effortless harmonising when African voices sang – hymns were what I mainly heard, and the harmonising itself a cross-cultural fusion. I was an adult before I began to d iscover the range and special qualities of African music, when my brother Colin gave me a recording made by the ethno-musicologist, Hugh Tracey. It was of Mozambican Timbila xylophones, with gourds as sounding boxes and extraordinarily complex rhythmic patterns. In the years of living in Zambia my response to that kind of music shifted – it was no longer someone else’s music, it was simply music, something anyone can connect with, but expressed in this way through this particular culture. 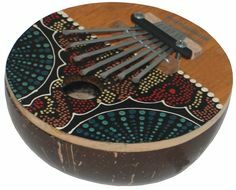 Much later, in travels across the continent with Save the Children, my colleagues would take me to their local markets, wanting me to take something of their culture back to share with the outside world – and it was musical instruments that I always chose. A deep thoated djem be drum from Mali; a small kora from Burkina Faso; a stringed instrument called a kirar from Ethiopia; an mbira from Zimbabwe; a child-size xylophone from Mozambique, that my grandchildren have played on. At the time I landed in South Sudan I was already working on a novel that drew on some of those strands of my life. It was a young woman’s journey – into exile, across cultures, into maturity. A lot of it had an African setting but it was about universal experiences – leaving behind the home of childhood, to which you can never return in the same way; about exile and loss, which refugees the world over have to come to terms with. But above all, I wanted it to be about the unexpected growth that can happen for any of us when we find ourselves in new and challenging situations. That challenge takes a particular form if we find ourselves – as Jennie in my story does – among people who are different from us – in race, class, language, culture, assumptions – in the things they enjoy, or make happen, or inspire them – in the music they respond to. We have the choice to close up against difference, or to be open to learning from it, something about ourselves. Whatever else this book became, it was going to be a celebration of that possibility of growth. The central thread that binds the story was represented on that airstrip in South Sudan – clapping and moving my feet with people whose lives had been devastated by war and human cruelty yet could still sing with vigour, and through the joy in singing could draw me in to be part of them for those few days. Like my other novels, it took years of living with it before it was completed, and more years looking for a publisher, which I never found. So I published it myself – something I’d learnt to do with my first novel. A few months later I had a phone call to say that it had won a Commonwealth Writers Prize – the best book in the African region. With no publisher behind it, it was not possible to build on that prize to get it widely known, but it has continued, slowly but constantly, to find new readers. Now, 18 years later, it is being republished – and in India. It’s an extraordinary feeling to know that it is setting out on yet another journey, and on another continent. It’s also a useful reminder to me of what the book is good for. Of all my books, it is the one for which I most often get letters from strangers. They tell me how much they were affected by it, and then they tell me their own life stories – often at length. A few have said it was ‘life-changing’. I’ve been thinking about why that is. It’s the music theme, partly. It’s the universality of the personal experience – loss, and having to move on to make a new life beyond it. But perhaps most important it’s about our human potential to connect. In the last two years, while I have been travelling with my latest novel, Uncertain Light, dire things have been happening politically in every country with which I have a personal connection, and many more beyond. When the government in Hungary puts up a fence to keep out refugees, and in Modi’s India writers who express secular views become a target for violence, and in the US white policemen shoot black men and women on sight because of supposed traffic offences, and in Pakistan bombs are detonated by people claiming to be Muslims to slaughter Muslims from a different branch of Islam, and in South Africa Zuma clings to power despite massive opposition and exposure of corruption, and in London a tower block where the poor and immigrants and asylum seekers are housed can go up in flames and burn people to death because someone in authority cut costs by using cheap, inflammable cladding for the building … Sorry, this list is getting too long and I still haven’t half begun … When all this happens, it feels we are living in a dark age. Yet through the barrage of deeply disheartening news, we have to hold on to the fact that every outrage of this kind is met by an equal and opposite force of goodness, of people who spring into action to support refugees fleeing across continents, and spontaneous groups form to protest these atrocities, and the people who come immediately to the aid of others are of every religion and colour and background. While all this has been going on I have been travelling to speak about my books to 30 audiences in three countries, and everywhere their responses have reminded me yet again of the power of fiction, how it can help us make emotional connections beyond our own experience – to enlarge the stock of empathy that society so badly needs. It feels the right time to send this book out again, to find new readers. If you can walk, you can dance has now had its first UK re-launch event. More than 80 people came to celebrate its new lease of life – people who had inspired aspects of the story – others who had read drafts – or who once it was published had reviewed it on Amazon – given copies to friends for Christmas – got their book group to read it – invited me as a speaker … That’s what it takes for something inside you to become a book, and reach readers. 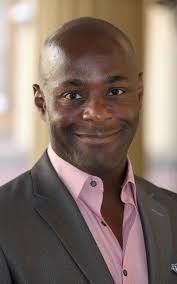 The actor Paterson Joseph read extracts, bringing them to life perfectly. In himself he represents something wonderful about the universality of culture – a boy from a Caribbean immigrant family who became one of Britain’s leading Shakespearean actors. Alastair Niven, for twenty years chair of the Commonwealth Writers Prize, spoke about the significance of this most cross-cultural of literary prizes. He is invited to many launches, he said, but a re-launch is special, for it’s a sign that a book has lasted. Judith Weir and Michael Finnissy, eminent composers who generously spoke to me about their work when I was writing, talked about their responses to the music in the book. Wendy Staal, the violin teacher who inspired me when I first joined the East London Late Starters Orchestra, played Bach – pieces which for her connected with the story. The community choir I take part in sang songs from three continents, which Adam Saunders, the choir’s leader, teaches us by ear; then he got everyone singing a traditional Zulu song that women revived in the apartheid years, honouring those who had died in the struggle, affirming their own resilience. So many voices, joyous, and moving. And one was Doreen Siame’s, once a school girl in my class in Zambia. Just by her presence she reminded me of how much I learnt from all those I taught. ‘There was a feeling of connectedness,’ she said afterwards, ‘a sense of belonging’. The connection went far beyond that room, to hundreds of others scattered around the world who have shared my books. Some of you will be reading this, so here’s my thank you to you. Now the task ahead – to bring the book to the attention of new readers. Two public events are already being planned in London for the autumn, and I’m looking for any other opportunities to talk about it – in the UK, in India and Pakistan where Niyogi Books has just released it, and anywhere else where it might find readers. If you, dear blog reader, can help get word out, that would be wonderful. The world is – inevitably – populated by people who are different from us. We don’t need to just walk our journey – we can dance it. Such an inspiring blog Marion. I’ll share it on FB. I read “If you can walk you can dance ” twice and recommended it to so many people, including my sister’s reading group and the reading cafe that I go to. It’s a remarkable book. so glad you are giving the world another chance to read this great book that means so much to me as a South African who lived alongside you in Zambia and UK for a lot of my life. This book has served as a touchpoint for me throughout life’s transitions, and even more so as I sit in my air conditioned and sterile office and dream of my days outside, with music, surrounded by people. I’m thrilled to hear it’s being re-launched and cannot wait to share it with people I love. Thanks, Marion! I am currently reading this book, and loving it. While on recent holiday in England and Wales, my husband and 16 year old daughter and I had the pleasure of connecting with many Natural Voice Network singing groups from Devon, Cornwall, and South Wales. While poking around a used bookshop in Cardigan, my dear daughter pulled your book off the shelf and said “Hey Mom! You’re always saying this. Take a look.” The serendipity was astonishing. Will be spreading the news of its re-release through the wide network of The Gettin’ Higher Choir here at home in Victoria, British Columbia.